Chef Philippe Excoffier, former personal chef to the U.S. Ambassador to France, shares his decadent chocolate soufflé recipe. 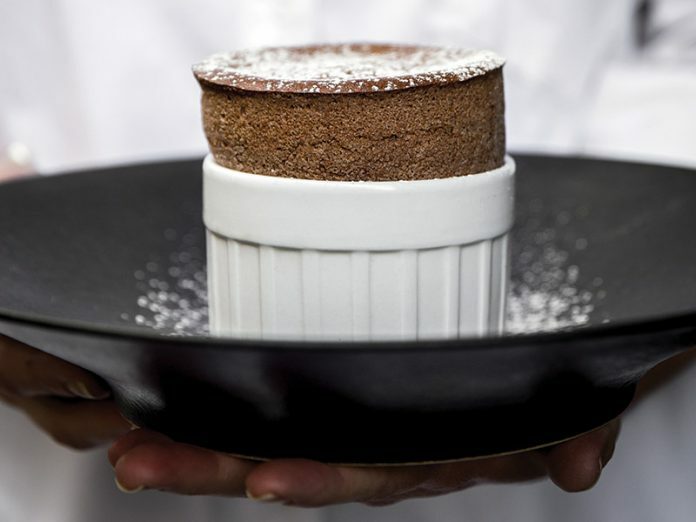 After making this soufflé with Chef Philippe himself in our Paris Perfect-booked exclusive cooking class, our Editor-in-chief, Brian Hart Hoffman, can truly say that this one is a must-bake! Trust us. Preheat oven to 375°F (190°C). Butter 6 (8-ounce) tall soufflé molds, and coat with sugar. In the top of a double boiler, combine chocolate and butter. Heat over simmering water until melted. Remove from heat; gently fold in egg yolks. Let cool for 5 minutes. In a large bowl, whisk together egg whites and sugar until stiff peaks form. Gradually fold egg whites into cooled yolk mixture. Divide batter among prepared molds, and wipe rims clean using the side of your thumb. Place molds well apart on rack toward top of oven. Bake for 11 minutes. Serve warm with strawberries. Philippe uses aged egg whites. What are the dimensions for the souffle mold? I have 4″ x 2″ but that doesn’t seem to qualify as tall. Where can I buy y’all ones? As long as they are 8oz ones, they should be fine! Happy Baking! What are the dimensions for the souffle mold? I have 4″ x 2″ but that doesn’t seem to qualify as tall. Where can I buy tall ones?